INCREDIBLE INVESTOR OPPORTUNITY or an INCREDIBLE PLACE TO LIVE! Very unique property consists of approx. 29 acres including hillside lots with AMAZING views. Property runs from a mountaintop on the east side to a mountaintop on the west side – Jomax Rd on the north to Briles Rd to the south. 6600 SF Ranch Style home with a 1500 SF guest house. Basketball court, storage sheds, RV Garage and so much more. Spectacular mountain, city & sunset VIEWS! Private and quiet, this property consists of six separate but contiguous parcels. Tax Information only shows one lot (2.5 acres), but this is a BULK sale of 6 lots (29 acres total). Seller is related to Agent. Directions: Grand Avenue to 163rd Avenue. North to Jomax. East to property. 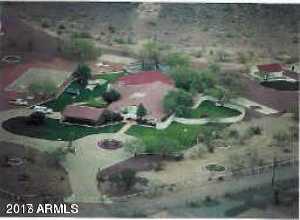 Please, send me more information on this property: MLS# 5812139 – $1,490,000 – 14945 W Jomax Road, Surprise, AZ 85387. I would like to schedule a private showing for this property: MLS# 5812139 – $1,490,000 – 14945 W Jomax Road, Surprise, AZ 85387.